This queen hornet was rummaging around in a hollow tree seeking a suitable place to hibernate when I disturbed her. Our native hornets get a bit of a bad press - maybe because they are so large, this one was around 2 inches long - but they are very rarely aggressive unless severely threatened and their sting is less toxic than a bee's. One problem is that people think they might be the "baddie" Asian Hornet that threatens bee populations - but these are quite different. 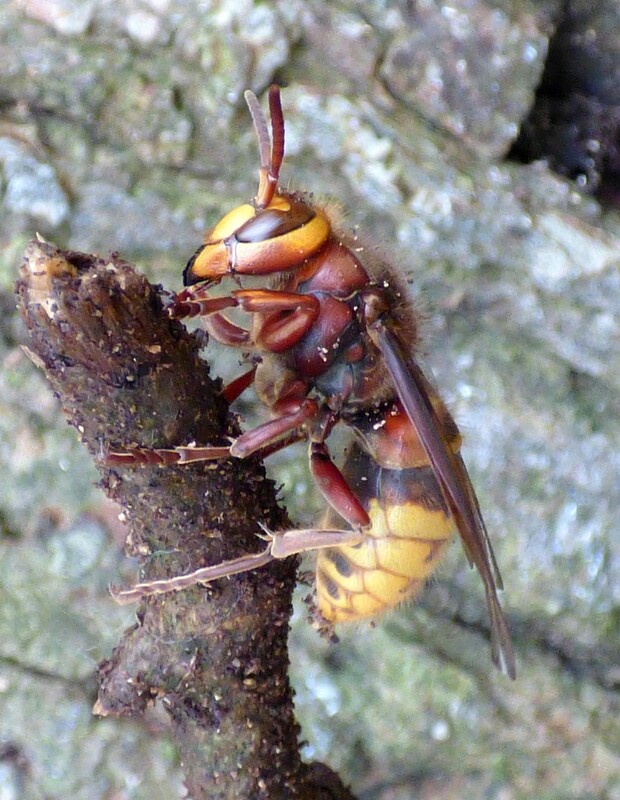 The Asian Hornet is darker, smaller, and without the wasp-like striped abdomen and instead have a solitary yellow band. Two inches long? Yikes! Brave close up! Oh the sting is so painful. I was stung by one many years ago when I was on a beach in North Wales. I put my arm down by my side not knowing that there was a hornet on my arm and the damned thing got me. @christophercox well if she had a bike she must have hidden it!